The best part about Super Fun 21 is you don’t have to figure out how to get to the casino, as it is available online by some of the best software providers in the industry. We detail everything you need to know on how to play Super Fun 21. 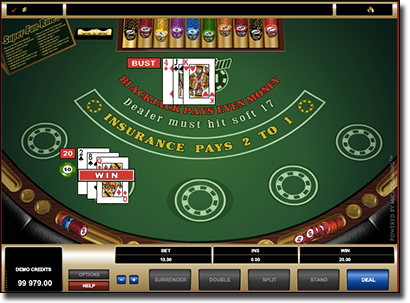 Players place their wagers as they normally would – via the animated interface online – and press the action such as Deal, Hit, Stand, etc., to proceed. The best part about this variant is when there is a hand of low cards, players have a high chance to make a hand of 21 with five cards, while a hand of high cards gives you the chance to score Blackjack – giving more chances to win. The house edge of Super Fun 21, like standard blackjack titles, relies on the number of decks in play as well as the perfect basic strategy. Additionally, it requires the dealer Hitting on soft 17s. While the house edge can be higher in comparison to Microgaming’s Classic Blackjack (can be as low as 0.13% with perfect basic strategy), it can be fun to mix up variants and stick with a one deck title to keep it still quite low. You can find the basic strategy online for Super Fun 21 and we recommend opening up a new tab so you can go back and forth to your game and the chart to make the house edge as low as possible – will be the above house edge when the perfect basic strategy is in play provided the same rules are followed. You will find each move calculated as the best move to make statistically against the dealer’s up card online, and we recommend practising it online before seeing it in play at a land-based venue where you can’t rely on an extra tab being opened. The best software developer offering the Super Fun 21 variant is Microgaming. It is played with a standard 52 deck and follows the rules we’ve included above. You will find Microgaming’s Super Fun 21 at our favourite Microgaming casinos including All Slots Casino, Royal Vegas Casino, and Jackpot City Casino – each available to access via downloadable software for PC users, or via your browser (Chrome, Safari, Internet Explorer, etc.,) for Mac and PC users. You will find these variants at our recommended online casinos each verified by reputable organisations as secure – simply follow our links from our homepage to access them.